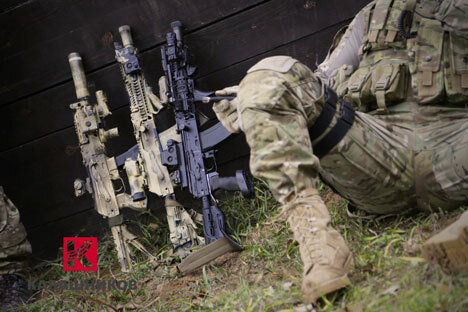 Russia’s iconic weapons manufacturer Kalashnikov has undergone a massive rebranding operation worth about $400,000. Its new slogan is “Protecting Peace.” The company, which is seeking to break into new markets in Africa, Latin America and Asia, is currently working on 30 major projects, from sniper rifles to pistols. The most interesting of Kalashnikov’s new military developments is the AK-12 rifle. This is the fifth generation of the “Kalashnikov system,” with the same gas-operated long-stroke piston system used by all the Kalashnikov rifles, historian and firearms expert Semyon Fedoseyev told RBTH. The contours of the rifle are also smoother than the previous Kalashnikov generations. There is a stock latch on the stock itself, which allows it to be folded to either side of the AK-12. The stock can be permanently replaced and is adjustable. The rifle also offers a more ergonomic pistol grip. As a result, the weapon has a longer service life, while preserving the legendary reliability of Kalashnikov rifles, Fedoseyev told RBTH.